The incident management team now responsible for fighting five wildfires in Glacier National Park and the Flathead National Forest wants you to know one thing about the rain and snow forecast through Monday: They won’t put out the fires. Reports from the fire lines Sunday, including the recently detected Boundary fire nearing the Canadian border, showed continued growth on multiple fire fronts and on both the western and eastern sides of Glacier Park. The Howe Ridge fire is now within 100 yards of the Inside North Fork Road in some places, John Pierson’s Type 1 team reported. And in the park’s remote northern reaches, the Boundary fire reached Boundary Creek and threatens to move into Canada’s Waterton Lakes National Park, where the superintendent has given Pierson the go-ahead to lead the firefighting effort. The arrival of cooler temperatures and rain/snow showers on Sunday did give firefighters relief from the hot, dry conditions they’ve endured for weeks. And it promised a few days reprieve to hone their plan of attack. The National Weather Service in Missoula said widespread valley rain and mountain snow will continue through Monday in central Idaho and western Montana. In fact, an upper level low pressure system is expected to remain over the Northwest region for the next five to six days. Through Monday, western Montana’s valleys could pick up .50 to .75 inches of rain, while the snow level is expected to drop below 7,000 feet. Up to 2 inches of snow is expected at higher elevations, with up to 6 inches expected in Glacier National Park. Temperatures in the park will be 10-15 degrees below normal on Monday, and will remain cool throughout the week, the Weather Service cautioned. 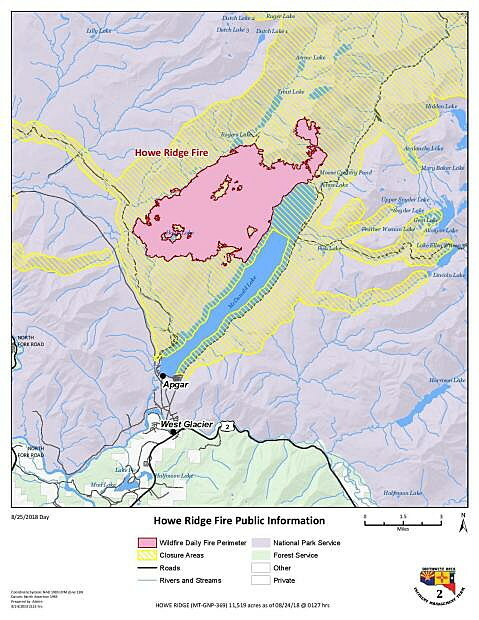 The Howe Ridge fire has now covered 12,420 acres and is slowly backing toward the Inside North Fork Road. Firefighters are using the road as a containment line and expect it to hold, according to Sunday’s fire update. On the northern flank of the fire, crews are using sprinklers to fortify their use of trails along McDonald Creek to stop the fire’s spread toward Going-to-the-Sun Road. They also hope natural features in the area – including avalanche chutes and other zones with sparse fuels – will limit the fire’s growth. Firefighters are strengthening the natural barriers with hand and aerial ignition of vegetation, hoping to starve the fire. Sprinkler systems are protecting a number of high-priority resources, including the Trail of the Cedars, Avalanche campground, homes and the ranger station along North Lake McDonald Road, and the Fish Creek campground. All evacuation orders and closures – including the western side of the Sun Road – remain in place. The Boundary fire has now covered 2,125 acres, after showing “moderate” fire behavior on Saturday night. Flames moved the fire to the north and east over the weekend, as far as Boundary Creek. One spot fire crossed the creek and was being doused with water Sunday by a Canadian helicopter. Later in the day, Pierson’s team said fire managers want to use “favorable terrain and natural breaks in advance of the fire perimeter (an avalanche slide path and a creek)” to establish control lines. “Aerial fire support, dropping water on the fire’s edge, and/or indirect attack actions (burning out fuel in advance of the fire) may be used to contain the fire’s spread north toward Waterton Lakes National Park or east toward Upper Waterton Lake,” said the report filed late Sunday on inciweb.org. Glacier National Park has closed all trails out of its remote Goat Haunt Ranger Station, and the tour boat from Waterton townsite is not stopping on the U.S. side of the lake because of the fire. 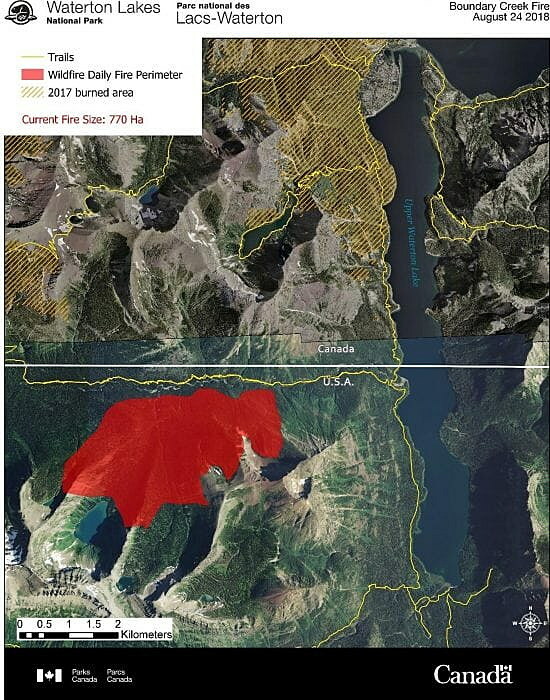 The Boundary fire is within striking distance of vast areas of Waterton Lakes Park burned during the 2017 fire season.